Chengdu, China: Every since I have been coming to China as a tour director people have asked me if I have ever been to their biggest holiday, Spring Festival. I got the feeling it was big, but until this year I did not know how big. This year I have been in China and decided to stay and see what really happens on the Lunar New Year. The Lunar New Year started at midnight February 9. I guess if you were going to compare it with a western holiday, it would be Christmas Eve. Everywhere I have gone the stores are closed and I think almost every person has returned home to be with their families. We are as I write in the 5th day of the holiday and the stores still have not opened. The newspapers are not being printed. I was invited by one of my Chinese guides, Carol Feng, to come to her hometown, which is Chengdu, to celebrate Spring Festival. Today we had a dinner with her mother’s family and tomorrow we will have another dinner with her father’s family. The rest of the week people visit other relatives, go to the parks and just enjoy being together with their families. 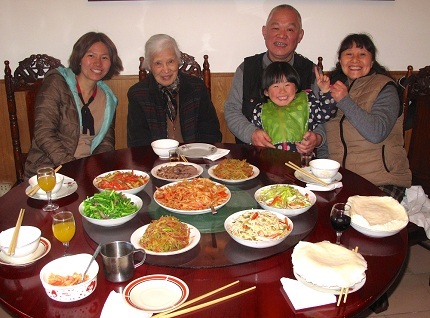 Carol’s father said that in the history of China, Spring Festival has always been a time when everyone returned to be with the family. I was in a small food market and heard someone speak good English. I complemented him on his English. He told me that he was from Chengdu but came home from America to be with his family for the holiday. Carol told me that preparing special food and eating together is the most important part of the holiday. Today Carol’s father was the cook. We had four generations gathered together. He prepared one dish for each person. Her father loves to cook so he did all the shopping and all the preparation of the food. The food was mostly vegetables, as her grandmother feels that vegetables are the healthiest food to eat. Because the father cooked, her mother cleaned up the dishes as the kitchen was only large enough for one dishwasher. In the photograph you can see all the dishes that were prepared. The part that was most interesting to me was that it only took him about 30 minutes to cook the dishes but it took him three to four hours to cut up all the vegetables. A Chinese kitchen is very simple. No fancy machines to do the work. The basics are the same, a butcher block to cut on, one knife to do all the cutting, a wok to cook in and a gas fire to heat the wok. A large spatula with an edge on it is used to stir and measure the ingredients. After the dinner, we went out walking and it looked like half the city was in the park playing together. It is truly inspiring to see a country of 1 billion 300 million people stop their work and return home for a week to two weeks to enjoy and celebrate their families. Want to Travel to China: If you are interested in going to China and would like to be in one of Dian’s groups email her at info@dianthomas.com or call her at 801 277 4332. Dian’s Book Tipping the Scales in Your Favor shares her weight loss journey. For years Dian’s tried and tried to lose weight but it was not until Jackie Keller said to her in California, “I can help you lose weight” that she caught the vision and lost over 115 pounds and, most important, she has been able to keep it off. Get Dian’s book today and begin the journey to healthy living. Go to www.DianThomas.com to learn more. Dian Thomas’s Idea Pack Library: You will never run out of ideas when you have this wonderful set of books. Check out Dian Thomas’ Creative Books Library Special: She now had a special offer to save 60% on 5 books and 1 DVD. Get Dian’s creative library for only $40.00. Save $60 dollar and have over 25 years of her creative and amazing ideas. This package will be great for gifts, for fun, and for kids and grandchildren. Take advantage of this limited offer at www.DianThomas.com.